Someday, I will do a real kitchen renovation. (And I already know who I want to hire to do it!). For now, I am working within my budget which means new paint and tile instead of the vinyl floor. We also did a new bathroom floor and vanity and installed some new hardware. 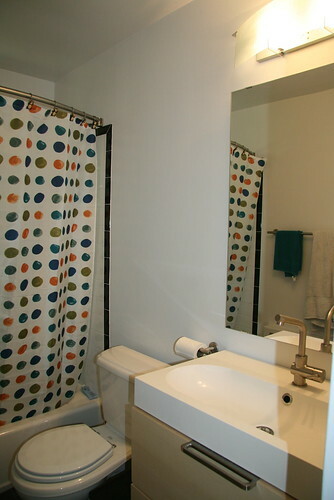 So far, we love the curved shower curtain rod! Yes – we are right there with you – I think our houses are the same era (early 50’s?) We plan to ditch the vinyl and repaint – maybe next summer. We have already spent so much on the house in our first year! (And we hope to gut it, too, eventually.) 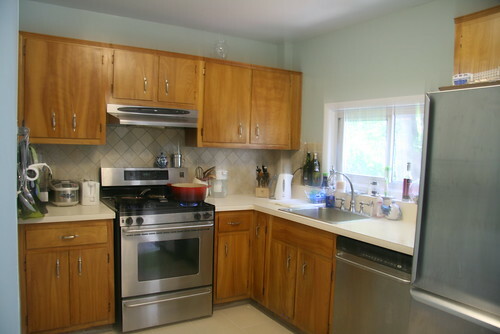 Have you considered repainting the cabinets or do you like the wood look? Ours were repainted ivory and it looks nice – vintage but fresh. ARE U TALKING ABOUT WATER LEAKING OUT OF THE SHOWER OR TUB ONTO THE FLOOR OR THE ROOM BELOW U? Or are you talking about the fixtures inside the tub? Plumber’s putty was my first thought, but I believe it may not be strong enough in the long-run for your purpose, a better choice might be liquid pipe compound which you can get from most plumber’s suppliers. Try googling first if you wish, to compare them.